With a history of polyphonic settings of the Missa pro defunctis going back over 500 years and with so many Requiem settings freighted with so much history, deciding to create a new Requiem Mass is a significant hurdle for any young composer. Alex Woolf has risen to the challenge and written a new Requiem to mark the centenary of the end of the First World War. The work uses the traditional Latin text of the Missa pro defunctis, plus new poetry by Gillian Clarke, national poet of Wales, and is written for choir, solo tenor and solo cello. 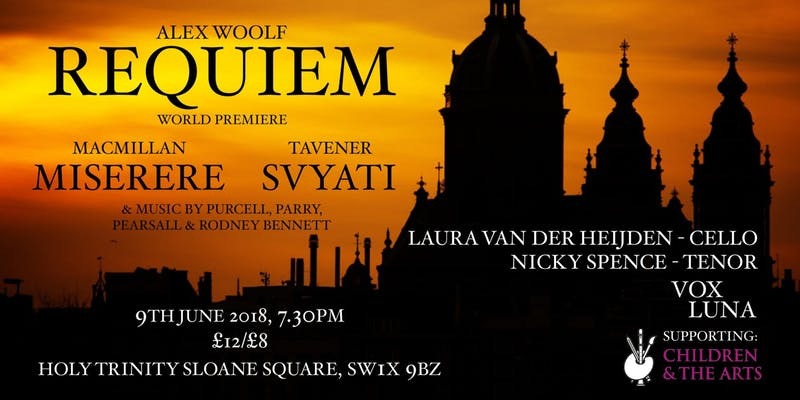 Alex Woolf's Requiem receives its premiere on Saturday 9 June 2018 at a concert at Holy Trinity Church, Sloane Street, Chelsea, in aid of Children & the Arts. Alex Woolf conducts the Vox Luna chamber choir with tenor Nicky Spence and cellist Laura van der Heijden. The programme also includes James MacMillan's Miserere, John Tavener's Svyati for choir and cello and music by Purcell, Parry and Richard Rodney Bennett. Alex Woolf was BBC Young Composer in 2012, and studied at Cambridge with Tim Watts. He is currently studying for a master's degree at the Royal Academy of Music where he has studied with David Sawer and Huw Watkins, as well as receiving tutelage from Oliver Knussen and Colin Matthews. Further details from the concert's EventBrite page.